With great sadness, we announce the passing of LBT missionary Terry Borchard Sunday, Aug. 10, after a battle with cancer. Terry has been a missionary with LBT since 1998. He and his wife Janet (Kunkel) have most recently been working on Scripture engagement with the Ipili people in Papua New Guinea. Terrance (Terry) Henry Borchard died on August 10, 2014 of multiple myeloma. He was born in Aberdeen, South Dakota on December 29, 1942 to Henry Borchard and Lydia (Luebke) Borchard, and was baptized into Christ on February 7, 1943. 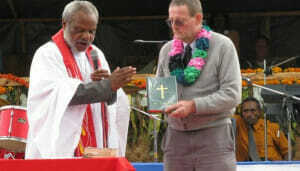 The local pastor blesses the Ipili language New Testament held by LBT missionary Terry Borchard. Terry is survived by his wife Janet; daughter Mary Dahlia, her husband Larry, and their daughters Arianna and Carissa; daughter Tami Enomoto, her husband Mamoru, and their daughter Miyuu; and daughter Rachel Schweitzer, her husband Tim and their son Caleb. Terry was preceded in death by his first wife Kathryn, and son-in-law Yoshiya Miyamoto. Terry graduated from Concordia College, St. Paul, MN, Concordia Senior College, Fort Wayne, IN, received a Masters Degree from Concordia Seminary, St. Louis, MO, and was ordained as an LCMS pastor. He also received a Masters Degree in linguistics from the University of Texas, Arlington, and a PhD in Intercultural Studies from Fuller Theological Seminary, Pasadena, CA. The annual mission festival at Trinity Lutheran in Mansfield, SD impressed him with the importance of mission work, and the Lord used that to call him into missions. His life’s work was as a Lutheran missionary and Bible translator to the Ipili people of the country of Papua New Guinea. He served his Lord Jesus in this work from 1969 until his death. The Lord gave him a gift for learning languages, and he worked with speakers of the Ipili language to translate the New Testament, and parts of the Old Testament into their language. He also taught others how to translate God’s Word. He studied the New Testament epistles in the original Greek to determine how all the parts of each letter fit together to communicate the meaning that the writer intended. This enabled the Ipili translation team to translate those books in a way that communicated the meaning clearly, accurately, and naturally. Terry’s family rejoices that he is now with his Lord and Savior Jesus Christ, and that when Jesus returns Terry, along with all believers in Jesus, will be raised to new life. International Myeloma Foundation, 12650 Riverside Dr. Suite 206, North Hollywood, CA 91607, online at myeloma.org. Our condolences to you Janet, and the family of Terry. Roman and I remember Terry very fondly. He was an honorable man. Please konw that many here at Peace Lutheran Church in Arvada, Colorado are praying for Janet and all of Terry’s family! We have such good memories of our times with Terry as he came to Peace to share the work he was doing. I, personally, remember his fervor for the Lord’s work, particularly that the printed Word of God be in the hands of every person!! I learned much from him! May our God of all peace comfort you all with His presence and assure you with His salvation that is our sure hope!! God go with you all!! My sympathies to Janet and all of Terry’s family — he surely was a blessing to many. Our family (Henry and Ethel Hanssen’s) got to know Terry when he was in the Dallas TX area. We are grateful that he is now with the Lord and his work on earth is done. Peace and blessed memories to his family and friends. May the Lord bless you Janet and family as you grieve over the loss of this wonderful man. A servant for the Lord, a gentle-hearted and most pleasant gentleman. May the Lord give you peace and joy as you lay your husband/father/friend to rest and cherish his memories. Into His rest he will be received with joy. Our deepest sympathies to Janet and the family in the passing of Terry. He was a good friend, a Godly example, a man of God who was full of faith and a gentle spirit and faithful to the Lord until the end. We will all miss working, serving and some of us even golfing together! He and his work will not be forgotten. Our sympathies to our friend Janet and the rest of Terry’s family. We are thankful for all that Terry did so that more people can read Scripture in their own language.